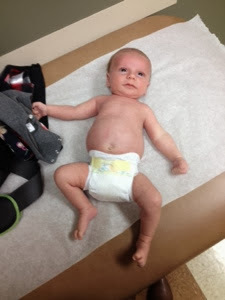 Today we had Coop’s one month check-up. I had no idea what to expect, but I knew I wanted him to look stylish. I dressed him up in his adorable fleece outfit. And we obviously had to take a mirror selfie. We kind of matched, right? 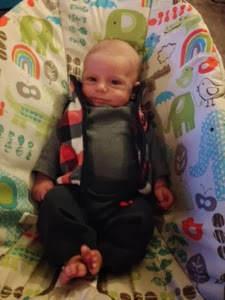 Smirking in his chair (aka taking a poop- hey at least he did it BEFORE the appointment). Once he was done “taking care of business” – we left for the doctor. 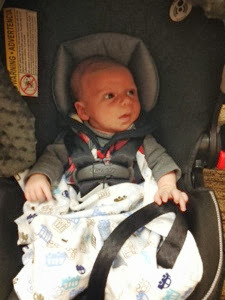 Usually he falls asleep during the car ride, but he was WIDE awake when we got to the doctor’s office. He was cracking me up with his facial expressions (per usual) and I was talking to him like a normal person. 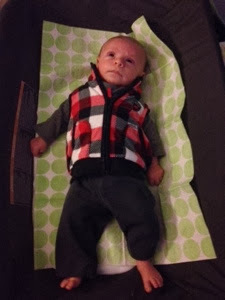 I also started singing along to the music playing in the office + making him dance in his car seat. The nurse came into the room and recognized us from our earlier visits. She took his head measurements and temperature. Cooper was EXTREMELY dramatic about the entire process- he definitely gets that from me. He started screaming the moment she took his temperature under his armpit. Obviously the temperature taking didn’t hurt him ONE bit, but I think he didn’t like the idea of having someone hold down his arm. He likes to wiggle and move around at his own will. How dare someone hold down his arm. Both of us were cracking up! “Oh Cooper, you’re making me laugh today,” she said. Then it was time to weigh him! 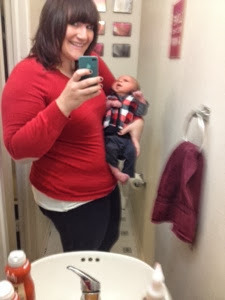 I stripped Cooper down to a fresh diaper – can’t let an extra pee or poo add to the scales! Poor baby had gas today – look at that belly! 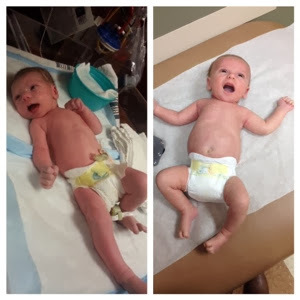 Last time, Cooper was 8 lbs and 5 ozs. 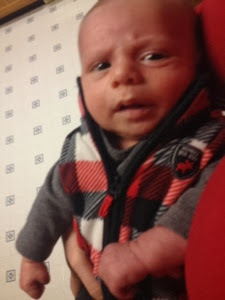 He was born 7 lbs even and dropped to 6 lbs and 3 ozs when we wasn’t eating well / had jaundice issues. So I was guessing he’d weigh about 9 lbs nad 6 ozs. But lil Coop exceeded my expectations! One hour vs. one month. Little man, I’m so happy that you’re growing into a happy and healthy little babes. Maybe next month you’ll start sleeping through the night. Yes? Maybe? At least two nights a week? DEAL!